The letter reads, in part, "On behalf of the people of Mali, UNMAS reiterates its appreciation to Schonstedt for its dedicated and continuous support to the mine action sector and commitment to preventing further injuries and loss of life amongst conflict affected communities." The full content of the report, including pictures (scroll down), can be found at http://www.schonstedt.com/newsfiles/UNMAS_Report_Mali.pdf. Moscow, Russia The Russian Defense Ministry has announced that starting in 2013, a change in policy will be implemented in the disposal of unserviceable munitions. Due to the significant number of accidents that occurred over recent years involving poor handling of munitions, open detonation will no longer be the preferred method of disposal. San Jose, Costa Rica The Minister of Interior, Police and Public Safety held a ceremony to mark the completion of the 2nd phase of the destruction of obsolete munitions. During the completed phase, over 300,000 munitions of various types and calibers were destroyed in 107 OB/OD operations. 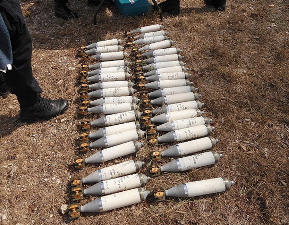 Since March 2011, over 900,000 munitions have been destroyed which includes the phase 1 and phase 2 efforts. New munitions and weapons destruction projects are slated for Honduras and El Salvador in the near future. Schonstedt Instrument Company has shipped 36 donated magnetic locators to members of the Joint Mine Action Coordination Team - Libya (JMACT). The JMACT is a partnership of the United Nations and international NGOs, formed to present a coordinated mine action response to the explosive remnants of war (ERW) threat in that country. Fighting in Libya since February 2011 has led to significant ERW contamination that threatens to increase the number of deaths and injuries of civilians and aid workers as well as jeopardize the delivery of life-saving humanitarian aid. Darwin, Australia The Australian Government kicked off a three year effort to clear UXO from Quail Island, Bare Sand Island, and Djadjalbit Island west of Darwin. The UXO in the area is a result of training conducted by the Royal Australian Air Force from 1945 to 1979. To date, the UXO mitigation strategy for the area has been signage and bi-annual surface inspections for UXO that was uncovered by tidal actions. Private contractor support is being used to support the detection of subsurface UXO with the Australian military EOD providing disposal support. Turtle experts have also been consulted on the project to ensure turtle nesting areas and habitats remain protected throughout the clearance.